Cafe Du Monde is another one of those establishments that you're not really allowed to avoid when visiting New Orleans. 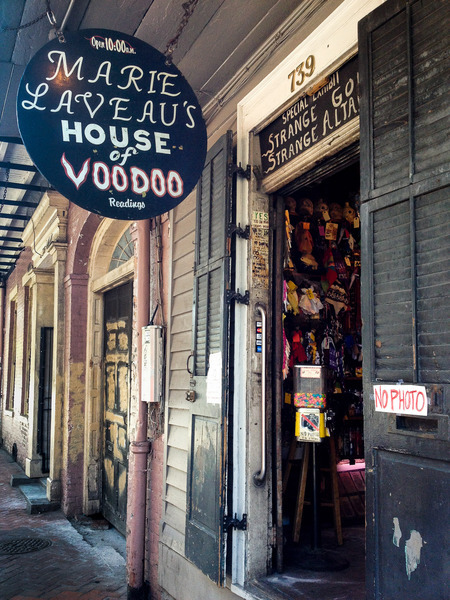 After the Po-Boy Showdown, we biked through the French Quarter, making a quick stop in Madame Laveau's House of Voodoo, which sounds a lot more interesting than it actually was. It's basically a souvenir shop with incense, voodoo dolls and cheap jewelry trying to pass off as being a mystical place. Perhaps it was at one point, but now it's aimed at wide-eyed tourists who want a piece of Cajun voodoo magic. No photos allowed inside. Womp womp. Unimpressed, we continued towards Cafe Du Monde, located catty-corner from Jackson Square. It's a huge open-air cafe with arched columns holding up it's high ceiling with about a hundred small round tables. 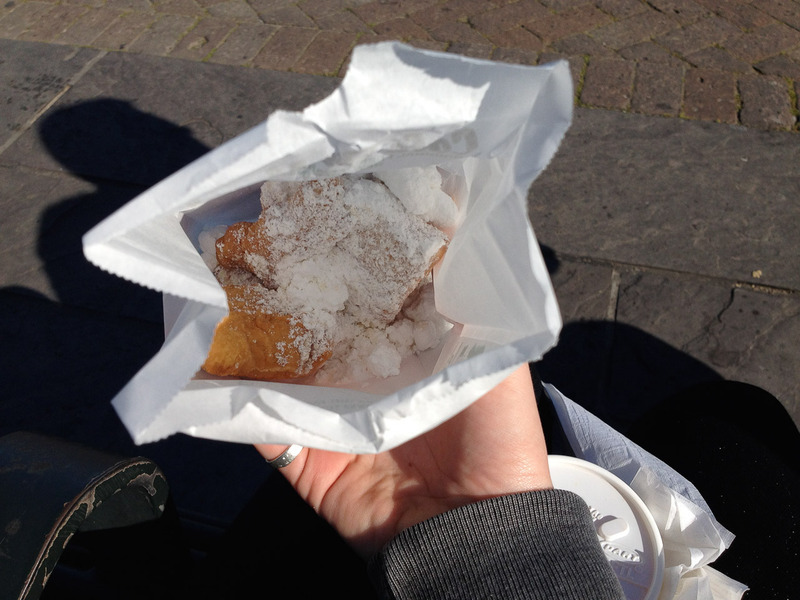 The place was packed with tourists chattering excitedly between sips of milky chicory coffee and bites of pillow-shaped beignets blanketed with powdered sugar. And those are the only things you can order there; coffee and French doughnuts (along with ground coffee and beignet mix). But they ain't doing so bad for a doughnut shop. 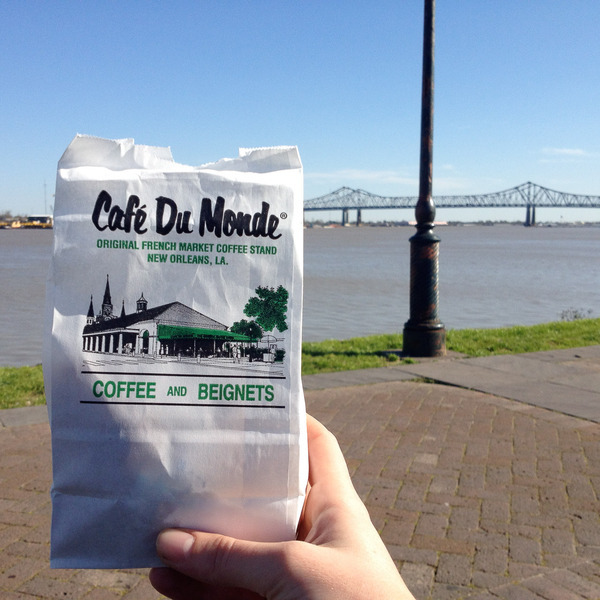 We didn't see any open tables among the sea of people, so we ordered two small chicory coffees and a bag of beignets in the to-go window and walked over to the river to enjoy our treats with a view. Enjoying our treats by the Mississippi River. The coffee wasn't life-changing but it certainly was milky, sweet and smooth and paired perfectly with the beignets, which were satisfyingly doughy and fried. They tasted like a fluffy funnel cake in an awesome way and were covered in an obscene amount of powdered sugar. A perfectly satisfying and quintessentially Nawlins' afternoon snack. Special thanks to Joseph S. (who suggested beignets, jazz, food, music, culture) and karenarms (who suggested Beignets, Great Food, Music, History) for making this blog post possible!